Nasopharyngeal carcinoma (NPC) is characterized by a high prevalence in Southern China, especially among Cantonese individuals of the Guangdong Province. Epidemiological studies have suggested that frequent exposure to high levels of nitrosamine from preserved foods such as salted fish could be a risk factor for NPC. Cytochrome P450 encompasses a family of enzymes that metabolize carcinogens and CYP2A13, a member of this family, is expressed predominantly in the respiratory tract with the highest levels in the nasal mucosa. In an effort to test whether a correlation exists between CYP2A13 genetic polymorphism and the risk of developing NPC, we sequenced all nine exons and the exon-intron junctions of the CYP2A13 gene in 45 NPC patients. We identified a total of 21 single nucleotide polymorphism (SNPs), including 7 novel SNPs. The most frequent functional variant allele was 74A-1757G-3375T-7233G with a haplotype frequency of 7.8% in the 45 NPC cases. In addition, a stop codon mutation was detected in one case. We then selected the 3 most frequent SNPs and one stop codon mutation to expand our study to a case-control analysis within the Cantonese population. A novel haplotype consisting 8 SNPs in introns, and four additional novel SNPs were identified; but no correlation between CYP2A13 genetic polymorphism and individual susceptibility to NPC was observed. Nasopharyngeal carcinoma (NPC) is rare in most countries (incidence below 1/100,000) . However, it has a high incidence in Southeast Asia, especially in the Guangdong province of southern China. This high-risk region is inhabited by several dialect groups (Cantonese, Hakka, and Chiu Chau), and each group has been shown to exhibit variable incidence of NPC. Specifically, the Cantonese men and women from the Xijiang river area suffer the highest rates (10/100,000) that are twice those of their counterparts in Chiu Chau and trice those of the Hakka dialect groups . The distinct geographical and ethnic distribution of NPC seems to be associated with certain environmental and hereditary factors. Firstly, Epstein-Barr virus (EBV) infection is widely recognized as the risk factor of NPC because of the detection EBV genomes in NPC tumor cells and elevated serum titers of IgA and IgG antibodies to EBV early and viral capsid antigens in NPC patients [3–5]. Secondly, epidemiological studies conducted in diverse populations have confirmed that frequent exposure to high levels of nitrosamine from preserved food such as salted fish, plum vegetable, preserved prune, fermented beans and eggs are etiological factors of NPC. Other environmental factors include communal kitchens or kitchen ranges without chimney, tobacco smoking, occupational exposures to wood dust and formaldehyde. In addition, the epidemiological data suggest that higher disease risk is associated with an earlier age at exposure [6–12]. Although many environment factors were associated with NPC, only a small proportion of the high-risk population develops NPC, indicating that there may be important individual genetic components in the etiology. There is accumulating evidence of association between genetic polymorphism of metabolic enzymes and individual variation in cancer susceptibility. In regard to NPC, several investigations performed in Taiwan and Thailand reported that individuals homozygous for an allele (c2 allele) of the CYP2E1 have an increased risk of NPC [13–15]. But no association was observed between genetic polymorphisms of CYP1A1, GSTM1, GSTT1, GSTP1, NAT2 and NPC susceptibility . CYP2A13, one of three members of the human CYP2A gene family, is expressed predominantly in the respiratory tract with the highest level observed in the nasal mucosa. The metabolic function of this enzyme was firstly studied by Su T et al, who demostrated that CYP2A13 exhibits activity in the activation of hexamethylphosphoramide, N, N-dimethylaniline, 2'-methoxyacetophenone, N-nitrosomethylphenylamine, and coumarin 7-hydroxylation. Specifically, it was noted that this enzyme is highly active in the metabolic activation of a major tobacco-specific carcinogen, 4-(methylnitrosamino)-1-(3-pyridyl)-1- butanone (NNK) . Recently, a large number of genetic polymorphisms of CYP2A13 have been identified in several ethnic groups [18–20]. The C/T polymorphism in exon 5, which leads to Arg257Cys amino acid change, was the missense mutation of CYP2A13 observed with the highest frequency. Compared with its wild type, this variant has significantly reduced activity toward NNK and other substrates, suggesting that this polymorphism could provide some protection against xenobiotics to the target tissues of individuals carrying the 257Cys allele . To date, there is no report about the relationaship between CYP2A13 genetic polymorphism and susceptibility to develop NPC. In this study we first sequenced all nine exons and exon-intron junctions of the CYP2A13 gene in 45 NPC patients. We, then, performed a case-control study focused on four CYP2A13 genetic polymorphisms among Guangdong Cantonese with or without NPC. In addition, we examined the expression of the CYP2A13 gene in the nasopharyngeal tissue. The expression of CYP2A13 in normal Nasopharyngeal and NPC primary tumors was examined by RT-PCR. Nasopharyngeal tissues were dissected from biopsies obtained from patients for diagnostic purposes Informed consent was obtained from every patient before operation. Total RNA was extracted with Trizol reagent (Invitrogen, CA). About 50 ng of total RNA was reverse transcribed using Sensiscript Reverse Transcriptase System (Qiagen, German) and oligod (T) 15 (Bioasia, China). The PCR amplification of CYP2A13 cDNA sequence was performed according a previously described method . The expected product is 494 bp in length (923–1416 in the coding region). A 580 bp cDNA fragment of the GAPDH gene was amplified as an RNA quality control. Genomic DNA was isolated from the peripheral blood of 472 incident NPC cases and 709 cancer-free controls by QIAamp DNA Blood Midi kit (Qiagen, German). All the cases were recruited from January, 2001 to December, 2003 at the Cancer Center of Sun Yat-sen University and were histologically confirmed as differentiated non-keratinizing NPC or undifferentiated NPC. Controls were recruited from individuals presenting at the People's Hospital of Guangdong Province for general check-up. Controls were frequency-matched to the cases by age (± 2 years) and gender. At recruitment, each participant was personally interviewed to obtain detailed information on ethnicity and family disease history. All subjects were Cantonese from the Guangdong province. The sequence of the complete human CYP2A13 gene described in the GenBank of NCBI (accession number NG_000766) was used as reference for the design of the primers. Firstly, the sequence of CYP2A13 was aligned with that of CYP2A6 and CYP2A7, the alignment results showed that the sequences of the three genes are highly homologous. To avoid the amplification of homologous genes, a pair of CYP2A13 specific primer (8KF and 8KR) was used to amplify the full-length of CYP2A13 gene that span from 148 bp upstream of the ATG start codon to 353 bp downstream of the stop codon. The 7971 bp PCR product was directly submitted to sequencing with primer for each exon using CEQ 8000 Genetic analysis system (Beckman Coulter, USA). 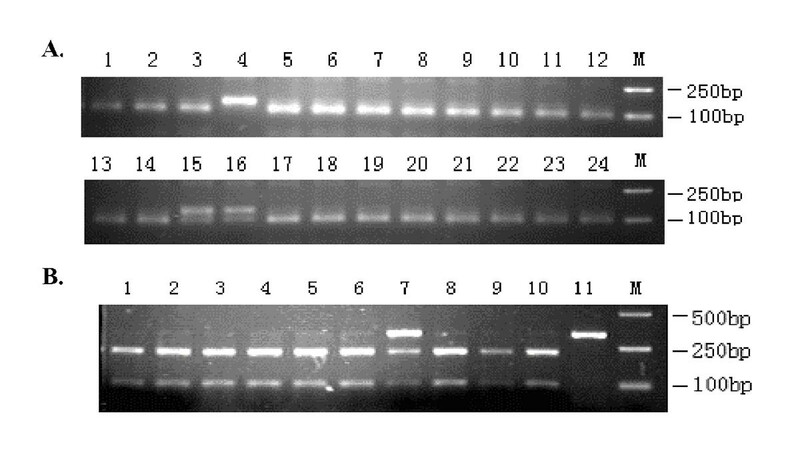 The long-distance PCR was carried out in a 25 μl reaction mixture containing 200 ng of genomic DNA, 12.5 μl of 2 × LA-PCR GC buffer I, 4 μl of 2.5 mMol/L dNTPs, 1 μl of 10 μMol/L each primer, and 1.5 unit of LA-Taq DNA polymerase (Takara, Japan). PCR cycling conditions consisted of an initial denaturation at 94°C for 30 s, followed by 35 cycles of denaturation at 94°C for 15 s, annealing at 62°C for 30 s, and extension at 68°C for 8 min (plus 10 added seconds each cycle for extension from the 16th cycle), and then a final extension at 68°C for 20 min. Primers used for PCR and sequencing are shown in Table 1. Note: Primers without annealing temperature were used for sequencing only. Mismatch PCR-RFLP were developed to identify the frequency of 74G>A in exon 1. The polymorphism of 74G>A is not located in a site of a restriction enzyme. A Nae I restriction site was created by introducing a G-C change at the 3'penultimate position of the forward primers for Exon 1F as described by Hernandez et al . To avoid the amplification of homologous gene sequences, nested PCR was used. Firstly, a 315 bp segment was amplified using primer 8KF and exon 1R. 0.01 μMol of each primer was mixed with 20 ng DNA in 15 μl reaction buffer containing 200 μMol of each dNTPs and 1 unit of Taq polymerase. The following thermal condition was used: 5 minutes at 94°C for initial denaturation, and then 30 thermal cycles, each consisting of a denaturation at 94°C for 30 seconds, annealing at 66°C for 30 seconds and extension at 72°C for 30 seconds, followed by a final extension at 72°C for 10 min. 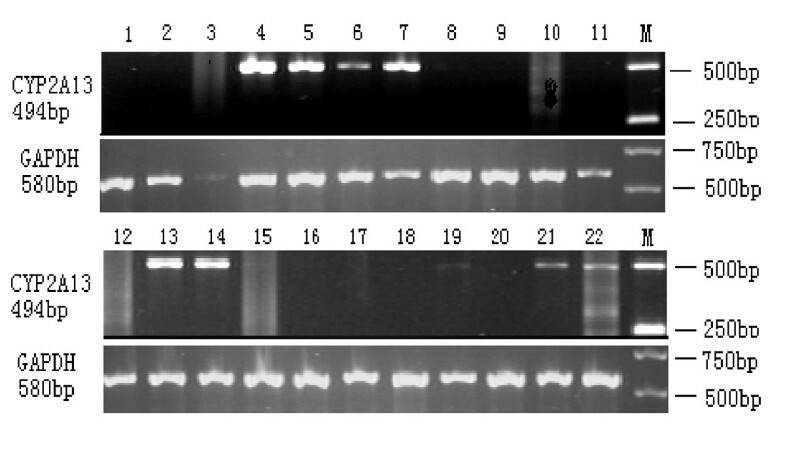 The PCR products of the first step were diluted ten times and then subjected to a second set of 35 cycles PCR using the mismatched primer exon 1F and Exon 1R. The reaction mixture and thermal conditions were identical to the first reaction except for the primer concentration that was 0.02 μMol for each primer. The 132 bp PCR product were digested with Nae I (Takara, Japan), the wild-type allele that carries a Nae I restriction site GCCGGC produced fragments of 101 bp and 31 bp, while the mutant amplicon was uncut. For the detection of 3375 C>T in exon 5, PCR-RFLP analysis which used as previously described by Zhang et . Briefly, a 332 bp PCR product was amplified, Hha I (Takara, Japan) cuts the wild-type allele to give two fragments (99 bp and 233 bp), but does not cut the 3375C>T allele, thus producing only one band (332 bp). Specific antibodies against CYP1A13 are presently not available, so expression of CYP2A13 was examined by RT-PCR. RNA was extracted from biopsies of 8 non-cancerous nasopharynx tissues and 14 NPC tissues. A pair of CYP2A13 isoform-specific primers was used to amplify a 494 bp fragment. As shown in Fig. 1, RNA expression of CYP2A13 was detected in 4/8 of non-cancerous nasopharynx tissues and 4/14 NPC tissues. The expression of CYP2A13 in non-cancerous tissues and NPC was not significantly different. Reference GAPDH gene mRNA was detected in all 21 samples examined. Each assay was performed in duplicate with similar results. RT-PCR analysis of CYP2A13 mRNA expression in non-cancerous nasopharynx and primary NPC tumors. Eight non-cancerous nasopharynx tissues and 14 NPC tissues were detected. The expected product size is 494 bp. Expression of GAPDH (580 bp) was amplified as an endogenous control. Lanes 1–8: RT-PCR of RNA from human non-cancerous nasopharynx tissues; lanes 9–22: RT-PCR of RNA from NPC tissues; M: DL 2000 molecular weight marker. All nine exons and exon-intron junctions of CYP2A13 were screened in 45 NPC patients. The full-length of the CYP2A13 gene was amplified for direct sequencing. and no evidence of promiscuous amplification of the homologous genes (CYP2A6 and CYP2A7) was observed. At least one SNP of the CYP2A13 gene was observed in 11 of 45 sequenced samples. No SNP was detected in other samples. Sample 7 exhibited most genetic polymorphism with 13 SNPs. A total of 21 SNPs of CYP2A13 were identified in 45 NPC patients, among these, 17 SNPs were observed in introns and the remaining 4 SNPs in coding regions (cSNPs). Within the 4 cSNPs we identified two missense mutations (74G>A and 3375C>T) leading to two respective amino acid changes (Arg25Gln and Arg257Cy). One nonsense mutation (578C>T) was detected in exon 2 resulting in a change from coding for an Arg to a stop codon in codonn 101; a synonymous mutation 1970 A>C was detected in codon 177. The detailed information on the location, frequency and sample distribution of SNPs is shown in Table 2. Notes: The sequence of the complete human CYP2A13 gene described in the GenBank (accession no. NG_000766) was used as a reference sequence, with the A of ATG start codon designated as +1. Among the 21 SNPs, the following four: 74G>A (Arg25Gln), 1757A>G, 3375C>T (Arg257Cys) and 7233T>G were simultaneously observed in homozygote conditions in one case and heterozygote conditions in five cases, suggesting a haplotype of 74A-1757G-3375T-7233G. Haplotype analysis demonstrated that the frequency of this haplotype is 7.8%, and the wide type haplotype constitute 76% of the chromosomes in those cases. In addition, eight SNPs (281A>G, 396A>G, 419G>A, 424G>A, 441C>T, 672C>A, 6958C>T and 7233T>G) located in introns were simultaneously observed as heterozygous in 3 samples. As shown in Table 2, 74G>A and 3375C>T were the most frequent missense mutation in 45 NPC cases, the genotype frequency of these two SNPs were determined in an expanded samples of 472 NPC cases and 709 healthy controls using Mismatch PCR-RFLP and PCR-RFLP (Fig. 2). In addition, two fragments including intron 1, exon 2, intron 8 and exon 9 were sequenced in 166 cases and 177 controls to determine the frequency of the stop codon mutation of 578C>T (Arg101OPA) and the most frequent SNP (7233T>G). Frequency of CYP2A13 genetic polymorphism obtained by PCR-RFLP and direct sequencing is shown in Table 3. No significant difference was observed between NPC cases and controls with regard to all of the detected sequence variations of CYP2A13. 578C>T changes were not observed in the additional NPC cases and controls. The linkage of SNPs 281A>G, 396A>G, 419G>A, 424G>A, 441C>T, 672C>A, 6958C>T and 7233T>G was observed in additional five NPC cases and seven controls, and haplotype analysis proved that the frequency of this haplotype is 2.0%. This is a novel allele of CYP2A13 that has not been reported in the Human Cytochrome P450 Allele Nomenclature. In addition, four novel SNPs (446 T>C, 447 G>A, 454 A>T, and 7196 C>T) undetected in the previous 45 NPC samples were detected in the expanded samples. Notes: Het: heterozygote; Hom: homozygote; a: Determined by mismatch PCR-RFLP; b: Determined by PCR-RFLP; Other SNPs were determined by sequencing; c: Haplotype 281A>G, 396A>G, 419G>A, 424G>A, 441C>T, 672C>A, 6958C>T, 7233T>G was represented by 281A>G in the Table; d: three SNPs (446T>C, 447G>A, 454A>T) were simultaneously observed as heterozygote in 2 samples, so they were represented by 446T>C in the table. Mismatch PCR-RFLP and PCR-RFLP assay for analyzing the 74 G>A and 3375 C>T polymorphisms. A: mismatch PCR generats a 132 bp amplicon which was digested by Nae I to fragments of 101 bp and 31 bp for the wild-type amplicon, but the 74 G>A mutatnt allele is uncut. Lane 4: homozygote (74 AA); Lanes 15,16: heterozygote (74 GA). Other lanes are digestion products of wild-type amplicons. B: PCR products of the wild-type 332 bp amplicon containing the 3375 C is digested by Hha I to fragments of 233 bp and 99 bp (lanes 1–6, 8–10). Lane 11: digestion of the homozygous 3375 TT mutant allele. Lane 7: digestion of heterozygote (3375 CT). In conclusion, 25 SNPs were identified in the complete analysis. Among them, fourteen SNPs had been already reported while eleven SNPs (424 G>A, 441 C>T, 446 T>C, 447 G>A, 454 A>T, 742 T>C, 760 T>C, 761 C>T, 867 C>G, 6958 C>T, and 7196 C>T) were novel. The expression of CYP2A13 in human tissue was previously investigated by Su et al  who reported that this gene was transcribed predominantly in the respiratory tract. In this study, the expression of CYP2A13 was detected in non-cancerous nasopharynx and NPC tissues. The expression of CYP2A13 in biopsies of nasopharynx and the reported enzymatic activity relevant to carcinogens metabolism provided a molecular basis for determining the genetic polymorphism of CYP2A13 in NPC patients and evaluate possible associations with disease predisposition. This is the first report on the genetic polymorphism of CYP2A13 in NPC patients. A total of 25 SNPs were identified and, among these, 11 SNPs including 424 G>A, 441 C>T, 446 T>C, 447 G>A, 454 A>T, 742 T>C, 760 T>C, 761 C>T, 867 C>G, 6958 C>T and 7196 C>T were new. In addition, we described a novel haplotype consisting of 8 SNPs within a non-coding region. Those new alleles and SNPS have been submitted to the Human Cytochrome P450 (CYP) Allele Nomenclature Committee. In 45 NPC samples, the most frequent functional variant allele of CYP2A13 was found to be 74A-1757G-3375T-7233G. In the CYP2A13 allele nomenclature http://www.imm.ki.se/CYPalleles/cyp2a13.htm, these four SNPs were included in the allele of CYP2A13*2B. In addition to these four SNPs, CYP2A13*2B consists of eight additinal SNPs (-1479T>C; -1429A>G; -1240A>G; -411G>A; 2211T>C; 6424C>T; 6432C>T; 7571G>C). The precise phenotype/genotype correlation of this allele has not been determined. The single mutation of 3375 C>T (Arg257Cys) was firstly identified by Zhang et al (19) who then investigated the functional significance of this point mutation. Compared with the wild-type Arg-257 protein, the variant Cys-257 protein is characterized by 37% to 56% less enzymatic activity toward all substrates tested. Since CYP2A13 is highly active in the metabolic activation of several carcinogens, it was suggested that the reduction in enzymatic activity observed in variant Cys-257 could provide some protection against xenobiotic toxicity to target tissue in individuals who carry this allele. Epidemiological studies related differences in the activity of this variant to cancer susceptibility. Wang et al reported that individuals carrying the variant CYP2A13 allele (3375CT or TT) have a reduced risk of lung adenocarcinoma in relation to light tobacco smoking (OR = 0.23; 95% CI = 0.08–0.68), but no protection against lung squamous cell carcinoma was observed . However, the functional consequences of 74 G>A (Arg25Gln) in exon 1 has not been investigated yet. In an alignment of P450 sequences http://www.icgeb.org/~p450srv/, codon 25 corresponded to an Arg for CYP2A13 and to a Gln for CYP2A6 while both genes code for an Arg in codon 257. It is possible that Arg25Gln mutation has less effect on the structure and function of the CYP2A13 protein than Arg257Cys. In addition, it has not been determined whether other SNPs in noncoding regions of this haplotype may affect the transcription of this gene. Therefore, the enzymatic activity and the expression level of the phenotype associated to this allele, consequence of Arg25Gln and Arg257Cys double mutation should be investigated. The Arg101OPA mutation represents a null allele, since the premature stop codon leads to the synthesis of a severely truncated protein 394 amino acids shorter than the wild type certainly devoid of catalytic activity. Zhang et al firstly detected this nonsense mutation in 1 of 31 Chinese individuals and not in other ethnic groups (23 White, 21 Black, 19 Hispanic, and 73 non-Chinese Asians). In the presented study, the stop mutation was detected in only 1 of 211 NPC cases and none of the 177 controls, suggesting it is a rare mutation in the Chinese population. However, Cauffiez recently reported that this deleterious mutation was the most frequent (5 %) variant allele of CYP2A13 in the French population, and that subjects heterozygous for the null allele have an elevated risk of developing small cell lung cancer (OR = 9.9; 95% CI = 1.9–52.2) . This is in contrast with the Wang's observation of a substantially reduction risk of developing lung adenocarcinoma in individuals bearing the less active allele (Arg257Cys) of CYP2A13. We carried a case-control study in an attempt to characterize CYP2A13 genetic polymorphism and NPC susceptibility. Our results show that frequencies of most of the SNPs in controls are higher than that of NPC cases, suggesting that the mutation of this gene could provide slight protection against NPC. But, among all the investigated SNPs (in exon or intron), no significant difference was observed to draw a conclusion. In summary, the genetic polymorphism of CYP2A13 in NPC was identified. No strong association was observed between the variant alleles and risk to develop NPC in the Cantonese population of southern China.